Maldives is the ultimate luxury destinations. It is synonymous with paradise, whether it is for scuba divers, sun worshippers or honeymooners. Located at the equator, the Maldives is blessed with some of the most spectacular beaches in the world, incredible underwater wildlife, and luxurious accommodations. Maldives has not many hotels, except in its capital Male. There are mostly resorts here. And most of the resorts take up their own island. 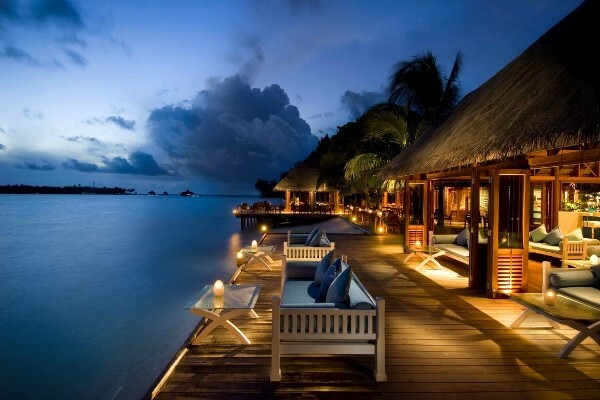 Here is a list of 10 of the most luxurious resorts of Maldives. 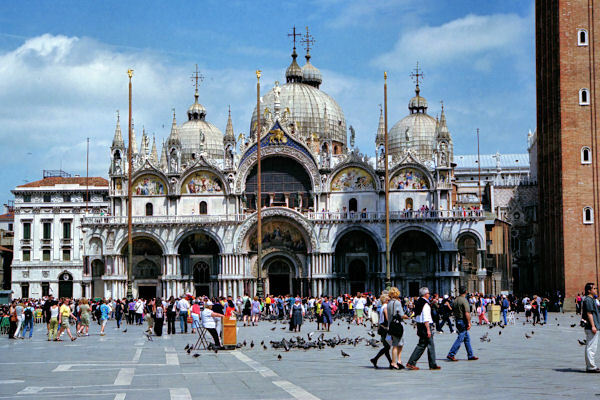 A stay at these resorts will cost you a bomb, but luxury does not come free. The Gili Lankanfushi, formerly known as Soneva Gili by Six Senses is an intimate coral island set on the isle of Lankanfushi in the North Male Atoll. The resort has a sparkling lagoon with jets threading across the water. Wherever you look, you will find marine life in plenty. The resort is just a 20-minute speedboat ride from Male International Airport. The luxurious dining comes in the form of private dinner on this island. The cuisine will increase your appetite with the local produce and fresh offering, and the extraordinary setting will leave a memorable impression. 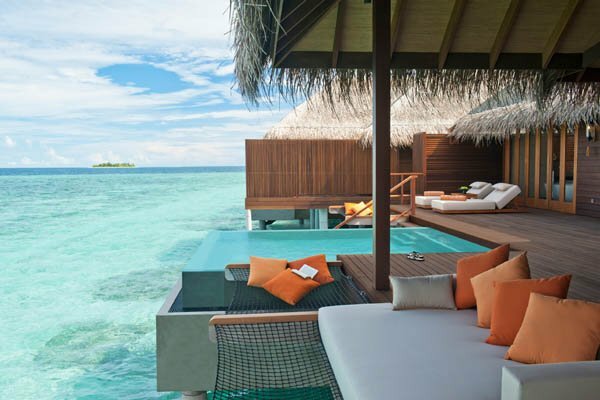 This island resort tops the must stay resort in Maldives. The Ayada Resort, located on the southern rim of the Gaafu Dhaalu Atoll, is one of the best resorts to enjoy your stay in Maldives. At 15 hectares, the resort is big enough to get lost in. The more walking and cycling you do on the Ayada Resort, the more surprises keep popping up. 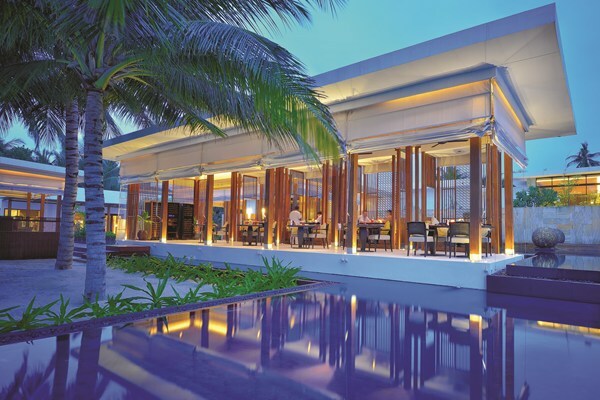 The restaurants at the resort offer some of the most sumptuous foods to the tourists. Take a stop at the Ottoman Lounge to settle in for a coffee or Shisha pipe. And there is a full-on Turkish bath in the spa. The best thing about this resort is that there is not even a hint of light pollution in the skies. The activities to enjoy here include diving, surfing, and snorkeling. 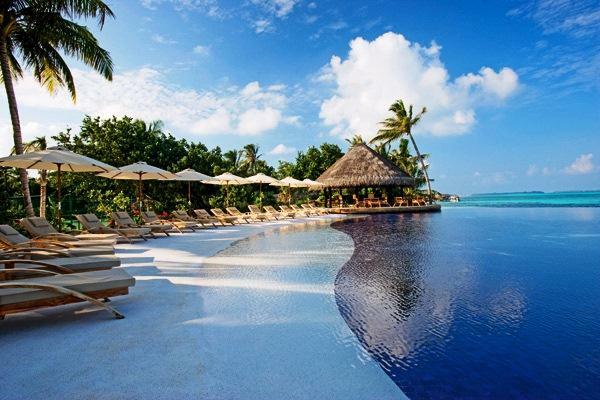 Taj Exotica Resort and Spa is a private resort of the Maldives. It is a member of the Leading Small Hotels of the World. The resort is spread along the serene lagoon and pristine beach. 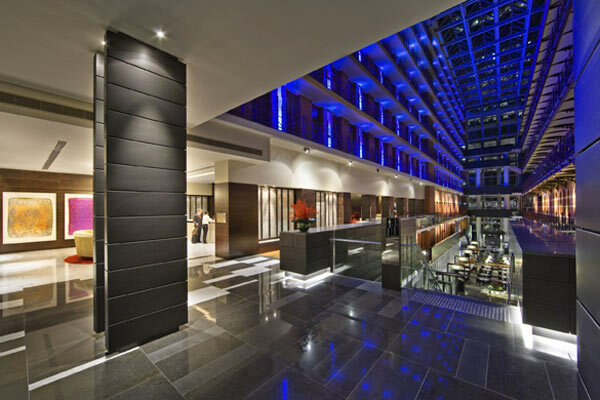 It offers the finest contemporary services and luxuries. The Jiva Grande Spa, an Indian spa is the main attraction in this resort. The resort provides a range of complete signature wellness experiences. You must get an Indian Royal Mud Bathing Experience here. The Lagoon Suites are the best rooms to book here. The suite comes with a living room, private pool and a deck filled with white sand. Besides, the resort offers a choice of gourmet cuisine, recreation facilities and water sports to give you once in a lifetime. The Lux Maldives Resort will give you a kaleidoscope of flavors, activities, and nature that will not fail to delight you. This luxury resort, being the only settlement on the Dhidhoofinolhu Island, offers insight into the unspoiled island living. The relaxed atmosphere of the place will delight you at every turn. You may come across a pop-up musical performance or an impromptu cinema screen on the beach. The lagoon is perfect for whale shark spotting or snorkeling. Every room in the LUX Resort is carefully designed to help you make the most of this enchanting resort. There are also two pools and spa at this idyllic resort. For a fun activity, follow the secret pathways through the tropical island to taste the island’s authentic cuisine at one of their numerous resorts. You are sure to be pleasantly surprised. Set amidst the sandy beaches and tropical foliage, Shangri-La’s Villingili Resort and Spa is a unique Maldives Resort property located in a boutique style environment. The resort is located in one of the largest islands of Maldives that is further connected to five other islands. The accommodations here include a tropical tree house, a private ocean retreat, and standard guest rooms. The resort also offers a selection of fine dining choices and innovative spa treatments that will stimulate your senses. There are also plenty of natural trails on both lands and under the sea. You can also bike through a Maldivian village from Shangri-La’s Villingili Resort and Spa. 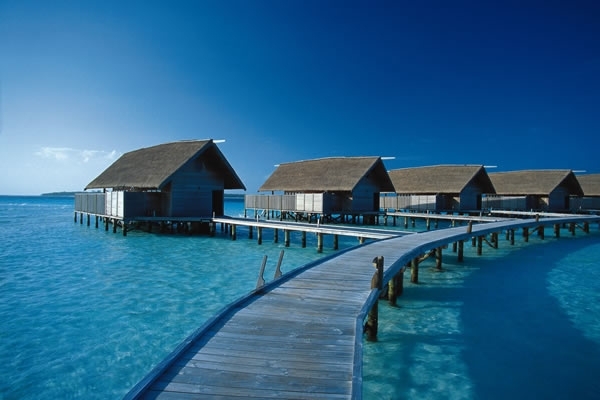 The Cocoa Island is rated as the most popular island resorts in the Maldives. It is ideally located along the white sandy beaches, crystal-clear beaches and stunning sunsets. It is the place to escape from the hustle and bustle of the city. It will soothe away your stress. The rooms are inspired by Dhoni boats, a kind of vessels used by anglers in the Maldives. The resort offers a central swimming pool, a lounge, bar, gym with yoga facilities and bar. There is also a library with a vast book collection. Some games are also available, that can be delivered to your suite too. The resort also sells necessities like hat and sunscreen. 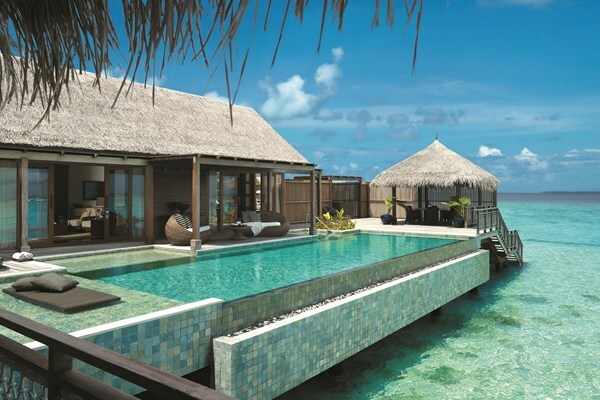 Immerse yourself in the tropical beauty of Maldives in the Four Season Resort. The place has an innovative and sophisticated choice of recreation, conservation and escapism. You will be awestruck seeing the luxurious setting. 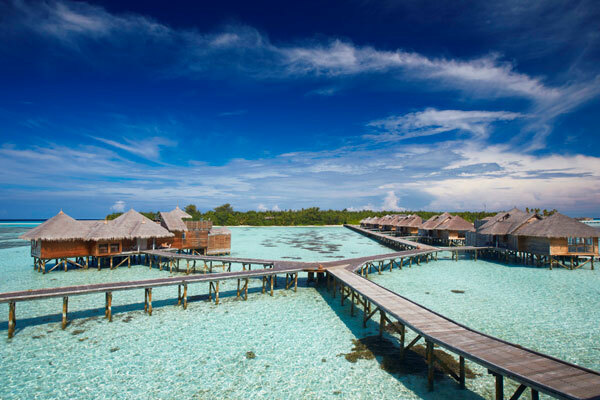 The resort offers 103 spacious villas spread across the remote jungle of the Baa Atoll. It provides impeccable services, world-class cuisine, five-star facilities and most importantly, a sense of discovery. Kudahuraa, its sister property is equally famous. It is a lush, tropical private island renowned for its charm and world class surfing facilities. Both the resorts are linked by Four Seasons Explorer that cruises between the two islands. The best activity here would be renting one of the many luxury yachts for an overnight cruise with a stop one a secluded beach. Truly romantic. The Island Hideaway Spa Resort and Marina belong to the Haa Alifu Atoll. It occupies just five percent of the crescent shaped island. The Meridis Dive also runs dive classes on the island. You can almost everything here, right from underwater photography courses to scooter diving. The manta rays and sharks visit the reef from May to October, so you will surely enjoy diving here. Jumeirah Dhevanafushi is another place to enjoy your stay in Maldives. The area is divided into two distinct areas- the main resort island and the Ocean Pearls, a group of villas located hundreds of meters away from the main island. There is a swimming pool, a restaurant and spa treatment rooms, so you don’t need to visit the main island at all. You will also get round the clock butler service, an outdoor bathtub, Apple Media Center and free Wi-Fi. The resort also holds a morning yoga session that will calm your nerves. Jumeirah Dhevanafushi is truly an exquisite place for you to experience. 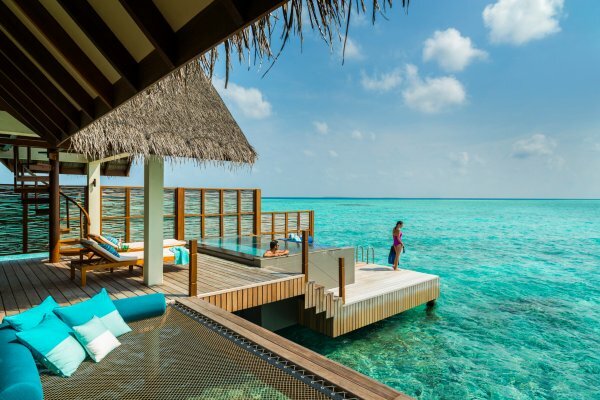 The Conrad Maldives island is stretched across two islands- the Rangali and Rangalifinolhu Island that is connected by a wooden bridge. 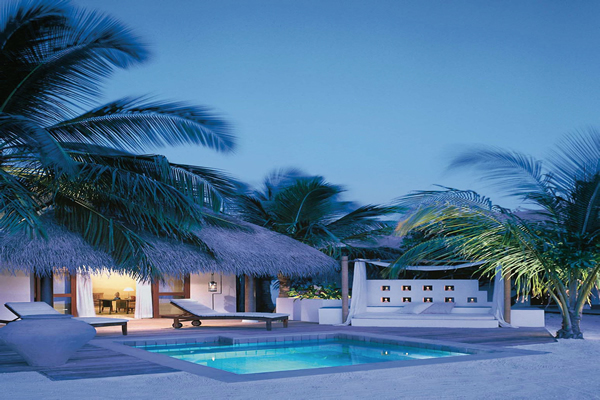 The resort has 79 exotic beach villas, 50 luxurious water villas and 21 spa water villas with private treatment rooms. The resort offers a host of facilities for children. The kid club offers activities like Pirate Day and also a mini submarine for exploring the coral reef. Also, a spa offers a wide variety of ice creams with flavors like apple pie and blueberry. The Twin Beach Villa is the best suite to book here. It has a terrace and even a Rollaway for children. The Conrad Maldives Rangali Island also boasts of world’s first all-glass, undersea restaurant. Have you ever visited Maldives? Did you stay in a hotel or resort? Which resort did you select? Tell us about your experience in the comment section.